There are only nine primitive neuroectodermal tumor (PNET) cases that have arisen in lung parenchyma without pleural or chest wall involvement in the literature. Here, we present a long–term survival case of pulmonary PNET. A pulmonary mass was detected in a 19-year-old man on a chest radiograph and computed tomography image. At the three-year follow-up, the mass had enlarged in diameter by two-fold. The lesion was resected via lower left lobectomy. Histologically, the tumor was composed of uniform cells with round nuclei and scanty cytoplasm arranged in lobules with rosettes and pseudorosettes formation. Immunohistochemically, the tumor was positive for CD99, vimentin, neuron specific enolase and chromogranin A, and negative for cytokeratins, CD3, desmin, and leukocyte common antigen. Pancreatic metastasis occurred sixteen months after the first surgery, which was managed by pancreatectomy. The patient has survived seven years after the mass was initially detected, and four years after the first lobectomy. Primitive neuroectodermal tumors (PNETs), first described by Hart and Earle in 1973 , belong to the group of highly malignant neoplasms and have a tendency toward early metastasis. This rare neoplasm is more prevalent in children and adolescents than in adults, as well as in the central than the peripheral nervous system. Peripheral PNETs (pPNETs) usually involve bone or soft tissues but have also been discovered in a variety of other organs, such as the kidney, urinary bladder, and heart [2–4]. Reports of pPNETs that arise in the lung parenchyma without pleural or chest wall involvement are extremely rare. Herein, we report an additional case of primary PNET in the lung, which then metastasized to the pancreas. In October 2005, a mass in the left lower lung lobe of a 19-year-old male was detected on a chest radiograph and a computed tomography (CT) image during a routine health examination (Figure 1a, b). 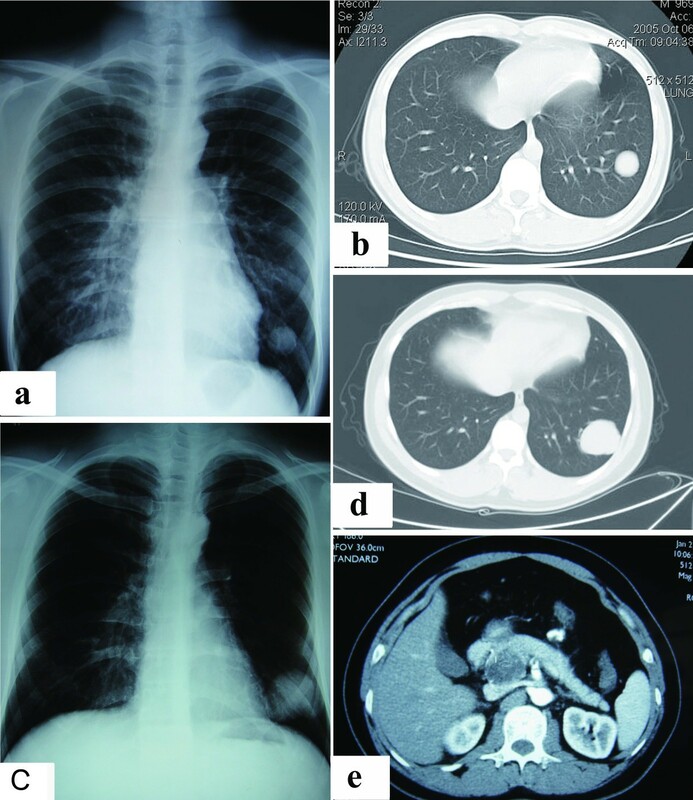 Because the patient was young and asymptomatic, and since the CT image indicated a benign tumor, a lung biopsy was not performed at the time. Physicians then recommended the patient for semi-annual follow-up. Chest radiographs and CT scans of lung and pancreas. a) Chest radiograph showing a mass in the left lung (October 2005). b) Chest CT showing a well-defined solid mass in the lower lobe of the left lung (October 2005). c) Chest radiograph showing an enlarged mass in the left lung (September 2008). d) Chest CT showing an enlarged mass in the lower lobe of the left lung (September 2008). e) Contrast-enhanced CT showing a huge solid mass with cystic areas originating from the pancreas. At the follow-up two-and-a-half years later, an imaging study showed the invariable lung tumor. At the year 3 follow-up, the mass was found to have enlarged remarkably. The patient was admitted to our hospital in September 2008 for further evaluation of the lung mass. A chest radiograph and CT scan showed a well-circumscribed tumor with a diameter of 5.0 cm in the lateral basal segment of the left lung (Figure 1c, d), but did not detect any bilateral hilar lymphadenopathy. A bronchoscopy showed no abnormal results. Standard staging procedures, including brain magnetic resonance imaging (MRI), abdominal ultrasonography, and bone scintigraphy, did not detect distant metastasis. A lobectomy of the lower left lung combined with a lymph node dissection was ordered. During the operation, the surgeon discovered a well-defined 5.5 cm × 5.0 cm solid mass in the parenchyma of the lower lobe of the left lung, without pleural or chest wall involvement. Microscopic analysis of the resected tissue revealed that the tumor was composed of small, round cells with inconspicuous cytoplasm and arranged in diffuse or compact sheets or lobules (Figure 2a). Immunohistochemical staining showed that the tumor cells were strongly positive for vimentin and CD99 (Figure 2b), focally positive for neuron specific enolase (NSE) and chromogranin A (CgA), and negative for cytokeratins, CD3, desmin, and leukocyte common antigen (LCA). Immunophenotype analysis ruled out lymphoma, desmoplastic small round cell tumor, neuroblastoma, small-cell carcinoma, rhabdomyosarcoma, and monophasic synovial sarcoma. Therefore, the postoperative pathologic diagnosis was PNET of the lung. Histologic features of the tumor in the lung and pancreas. a) The pulmonary tumor cells had round or oval nuclei, a fine chromatin pattern, and indistinct cytoplasm and nucleoli. Mitotic activity was very high (HE, 400×). b) The pulmonary tumor cells showed a consistent and strong membranous expression of CD99 (SP, 400×). c) Diffusely infiltrative tumor cells were present in the pancreas parenchyma (HE, 200×). The subsequent pathology indicated clear surgical margins and pleura and lymph nodes free of tumor cells. The postoperative course was uneventful. The patient refused adjunct radiation or chemotherapy after the initial surgery, but participated in regular follow-up examinations. After a 16-month disease-free period, the patient complained of several episodes of a dull ache in the upper right quadrant of the abdomen. The patient was admitted to our hospital for further evaluation in February 2010. An ultrasonography and contrast-enhanced CT scan of the abdomen revealed a 3.5 cm × 4.0 cm mass in the pancreatic head (Figure 1e). The mass had solid and cystic characteristics and was difficult to distinguish from the surrounding pancreas parenchyma. Laparotomy showed a 3.0 cm × 4.0 cm solid and cystic mass on the surface of the uncinate process of the pancreas. The boundary between the mass and pancreas parenchyma was obscure and the mass appeared unencapsulated. An en bloc resection of the mass was accomplished through the standard Whipple procedure . Diffuse infiltrative tumor cells were present in the surrounding tissue (Figure 2c). Immunohistochemical staining of the tumor cells confirmed strong membranous expression of CD99 and focal expressions of vimentin and synaptophysin. The immunophenotyping results and patient history of pulmonary PNET indicated a postoperative pathologic diagnosis of metastatic pancreatic PNET. Again, the patient refused adjunct radiation and chemotherapy. To date, no evidence of tumor recurrence or metastasis has been found. The patient has survived seven years after the mass was initially detected, and four years after the first radical resection. pPNETs belong to the family of “small round cell tumors” that show varying degrees of neuroectodermal differentiation and are derived from cells originating from the neural crest  and are characterized by a specific chromosomal translocation, t(11;22)(q24;q12), in most cases. Among the reported cases of PNET, tumors involving the thoracopulmonary region were first reported as “malignant small cell tumors of the thoracopulmonary region in childhood” by Askin et al. in 1979, which led to these tumors being referred to as Askin’s tumors . Conventional light microscopy analysis of PNETs shows undifferentiated small, round cells with uniform, unconspicuous nuclei and scanty cytoplasm arranged in lobules with rosettes and pseudorosettes formation; in addition, there is little or no stroma. Immunohistochemically, PNETs are positive for CD99 antigen, but CD99 immunostaining is not specific and the results must be interpreted in combination with other findings. T lymphoblastic lymphoma, poorly differentiated synovial sarcomas, stromal tumors, and rare rhabdomyosarcoma may show CD99 positivity. Vimentin stains most tumor cells and neural markers, such as NSE, and is frequently expressed by tumor cells . Cytokeratin-positive staining has also been reported in some cases of primitive neuroectodermal tumors . To diagnose a tumor as PNET, it should display small round cells forming rosette and pseudorosettes, and should be positive for at least two of the neural markers. Ultrastructural analysis usually shows PNET cells to have complex cytoplasmic processes, microtubules, and few neurosecretory granules. The following chromosomal translocations have been associated with PNET specimens: t(21;22)(q22;q12), t(11;22)(q24;q12), t(7;22)(p22;q12), and t(7;22)(q22;q12) . Thus, the diagnosis of PNET necessitates histopathological, immunohistochemical, ultrastructural, and, if possible, genetic analyses. The differential diagnosis of PNETs includes neuroblastoma, lymphoma, small-cell carcinoma, rhabdomyosarcoma, monophasic synovial sarcoma, and desmoplastic small round cell tumor, all of which are indistinguishable by conventional light microscopy . However, due to the different prognostic characteristics and therapeutic schedules for each of these tumor types, differential diagnoses are essential. Immunohistochemical positivity for CD99, NSE, synaptophysine, and chromogranine A are very useful in differential diagnosis. Furthermore, the presence of Homer-Wright rosettes are typical for neuroblastomas, which are also positive for NSE, synaptophysine, and chromogranine A, but negative for CD99. LCA positivity supports the diagnosis of lymphoma, but T cell lymphoblastic lymphoma may be negative for LCA and positive for CD99 and CD3. Small-cell carcinoma is almost always positive for cytokeratin, while rhabdomyosarcoma is positive for desmin, actin, myoglobulin, and monophasic synovial sarcoma is positive for CD99, cytokeratin , EMA. The desmoplastic small round cell tumor is characterized by sharply circumscribed nests or clusters of small, undifferentiated cells surrounded by a desmoplastic stroma, and show positivity for cytokeratin and desmin, but negativity for CD99. Therefore, the phenotypes observed in our case, i.e., positive expression of CD99, vimentin, NSE, and synaptophysin, and negative expression of cytokeratins, CD3, desmin, and LCA, are highly suggestive of a pulmonary PNET [3, 9–11]. Despite the patient’s history of pulmonary PNET and imaging findings that were consistent with primary pancreatic cancer, we initially suspected primary serous cystic pancreatic neoplasm because metastasis of a PNET to the pancreas had never been previously reported. However, the patient’s histological findings indicated no transition had occurred from the pancreas to the neoplastic tissue. In addition, there were no clinical signs of chronic pancreatitis in the surrounding parenchyma. Considering the expression of CD99, NSE, and synaptophysine, as well as the primary pulmonary PNET, we believed the findings strongly supported a diagnosis of metastatic pancreatic PNET. According to the literature, there have only been nine reported cases of PNET originating from the lung without pleural or chest wall involvement [9, 12–17]. Ages of the reported patients have ranged between 8 to 67 years, with a mean age of 33 years. There is a slight male predominance, with the male:female ratio being 5:4. Five of the cases originated from the left lung and four from the right. Despite treatment with various combinations of surgery, chemotherapy, and radiation therapy, the survival rate in the previous reports was poor; typically, the two-year survival rate after operation is 33.3%. Of the nine reported cases, seven were followed-up; four were alive without disease at eight months, 16 months, 22 months and two years after surgery, and three had died at three months, two years, and two years after operation due to local recurrence or widespread metastatic disease. Furthermore, the predominating metastatic sites are the lungs, adrenal glands, and ovaries. In our case, no adjunct radiation or chemotherapy was given after the initial surgery, due to patient refusal. However, recurrence was detected at sixteen months after the first resection and appeared as a metastasis to the pancreas. The patient underwent the second radical surgical resection of the metastatic tumor. Adjunct radiation or chemotherapy again refused by the patient after the second surgery. To date, no evidence of tumor recurrence or metastasis has emerged. The patient has survived 32 months after the second surgery. The long-term survival of the patient may have been a result of the two radical surgeries alone, but we believe that his prognosis would have been better if the lung biopsy was performed promptly in October 2005. We speculate that close follow-up with immediate surgical intervention when required may have helped to prolong the survival of our case . We reported a rare case in which a primary pulmonary primitive neuroectodermal tumor metastasized to the pancreas. The primary and metastatic tumors were resected respectively, and no adjunct radiation or chemotherapy was given before or after the two surgical procedures. This newly described PNET patient has the longest survival (seven years) and the longest post-operational follow-up period (four years) of all the cases reported in the literature to date. We speculate that close follow-up with immediate surgical intervention when required may have helped to prolong the survival of our case. This study was supported by a grant from the 2010 Technology Fund of the Inner Mongolia Science and Technology Department (No. 20100501). SL gave the final histopathological diagnosis, performed the literature review, acquired photomicrographs, and drafted the manuscript. GZL participated in patient management and edited and revised the manuscript. WXL participated in patient management and drafted the manuscript. All authors read and approved the final manuscript.